Two weeks ago, the British government’s Home Office rejected the asylum request of Hamza Bin Walayat because, while he described himself as a “humanist” worried about religious persecution in his home country of Pakistan, be could not answer questions about Plato and Aristotle. Now, 120 philosophers have signed onto a letter objecting to the decision. Walayat said he had received death threats from members of his family and community in Pakistan after renouncing Islam, integrating into secular British life, forming a relationship with a non-Muslim partner and refusing to conform to the expectations of conservative Islam. Apostates are subject to discrimination, persecution and violence in Pakistan, and blasphemy is punishable by death under Pakistani law. In its letter of refusal, the Home Office said Walayat had “been unable to provide a consistent or credible account with regards the main aspect of your claim, namely that you are a humanist”. When tested on his knowledge of humanism, Walayat gave a “basic definition” but could not identify “any famous Greek philosophers who were humanistic”. His interviewer has informed Walayat that he was referring to Plato and Aristotle. We write as members of the international community of academic philosophers, including many from the UK. We ask you to reconsider the decision to refuse Hamza bin Walayat’s request for asylum on the grounds of his inability to answer correctly questions about ancient Greek philosophers (Plato and Aristotle). We are puzzled by the presupposition of the Home Office that knowledge of these philosophers is a requirement for authentic self-identification as a humanist. The Western philosophical canon is not the basis of the curriculum in all countries. To expect someone from Pakistan to know about Western philosophy is like expecting someone from Britain to know about Islamic philosophy. Indeed, Plato and Aristotle do not feature in the compulsory years 1-12 levels of the UK National Curriculum: one would have to study A-Level Philosophy or Religious Studies to encounter them. UNESCO reports that “The main goal of education in Pakistan is to develop citizens who live their lives according to the teachings of Islam as stated in the Quran and Sunnah but also to become true practicing Muslims” (RUSHAP 2010). This is obviously incompatible with the open inclusion of humanism. The nomination of Plato and Aristotle as humanists has no scholarly basis. There are several operative senses of ‘humanism’ within modern Western intellectual history (see, e.g., Cooper 1999), none of which owe any distinctive debt to Plato and Aristotle. Indeed, one of the most important modern conceptions of humanism appeals to the ‘naturalism’ expressed in the modern scientific worldview – a development that only emerged in the last four hundred years (see, e.g., Kitcher 2011, Kurtz 1973). 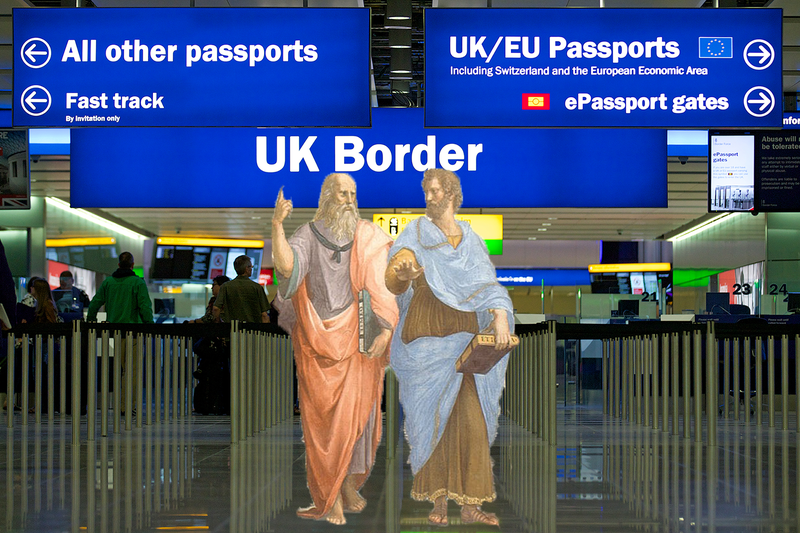 Moreover, the Home Office’s claim that Plato and Aristotle could be considered precursor humanists makes no sense: Plato wasn’t a “humanist” in the sense of that term specified in this article by Humanists UK, namely this: “As a descriptive term, humanists can be someone who has simply rejected religious belief but holds some positive conception of human values.” Plato does not “reject religious belief”: he presents arguments for the existence of a divine creator and the immortality and transmigration of the soul. And there is scholarly debate about the extent to which he can be said to hold a “positive conception of human values”: in many of his mature works he proposes a theory of Forms, which locates the source of value in a supernatural domain independent of the human world. Aristotle is also complex: he believes in an objective human good, but he also believes that this good is shaped by its relation to a divine Unmoved Mover. Humanists in past ages disagreed – often fiercely – amongst themselves about the relevance to their projects of Plato and Aristotle, let alone their status as precursors. For someone to be a sincere atheist (or theist), they don’t have to know very much about the philosophy of atheism (or theism). Many sincere adherents of many religions do not have an extensive philosophical or theological understanding of the doctrines and practices they profess (nor need they): what is primary is one’s commitment to a set of values and convictions, expressed through one’s life and conduct (see, e.g., Cottingham 2005). It is not necessary to be an intellectually engaged scholar of humanism in order to be classed as an authentic humanist. (By this absurd criterion, there would only be hundreds, not millions, of ‘authentic’ Christians in the UK, since intellectually sophisticated understanding of doctrines like the Trinity is confined to those with academic training in theology). For someone to be persecuted, perhaps killed, for being a sincere atheist (or theist, or humanist), they need to know nothing about the philosophy of atheism (or theism, or humanism). Therefore, we deem it unreasonable for the Home Office to make decisions about asylum on the basis of anyone’s philosophical sophistication. The decision concerning Hamza bin Walayat’s asylum request should therefore be reconsidered immediately. The letter and its signatories can be found here. An abbreviated version was published in The Guardian. There’s some further reporting in The Guardian here.